I know reinvention is at the heart of many forms of creativity, but sometimes I can't help being amazed at how often I see something in a children’s book that I've never seen done before, quite in that way. Take first-time children’s author-illustrator Diane Kredensor's Ollie & Moon. At one level, it's simply a cute puzzle of a picture book, with the offbeat sensibility of much of today's animated TV (the field in which Kredensor has made her name to this point, as an animation artist on shows like Pinky and the Brain and WordWorld). 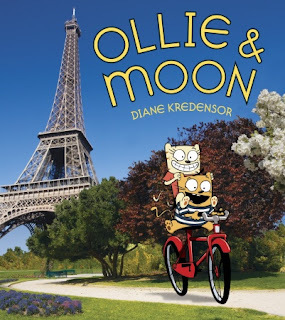 Ollie and Moon, our protagonist cats, are best friends, and since Moon loves surprises, Ollie loves to surprise her; for her birthday, he has a big one planned. As he leads her through the streets of their native Paris, Moon makes guess after guess about what her surprise might be. But while she is able to find out a lot about it (that it's round, and has both hooves and feathers, for instance), she can't seem to put all the pieces together. Young readers get to guess right along with her, of course, and the ever-longer and -stranger list of descriptions will soon have them giggling; the humor and pacing make this book a perfect bedtime read. It all adds up to a picture book that's not only a lot of fun, but feels like none other out there—the elements of an instant classic. And so far, to our two-year-old, that's exactly what it is. •The ever-prolific Recess Monkey (shown above) are coming east again as part of a "sneak preview" of the June release of FLYING!, their latest studio album. They'll be playing a free show at the central branch of the Brooklyn Public Library on Saturday, April 30, at 1 p.m., and then another as part of the 92YTribeca's B.Y.O.K series (tickets $15, with kids under 2 free) on Sunday, May 1, at 11 a.m. As I can testify firsthand, parents and kids alike should jump at any chance they get to see these guys whenever they're on our coast! •Oklahoma City's soul-and-funk-tinged duo Sugar Free Allstars will be at Symphony Space on the Upper West Side on April 30 at 11 a.m. (tickets $11 to $20). They, too, have a new release—a fun single recorded with my personal hero of kid music, Secret Agent 23 Skidoo, titled "Cooperate." •Lucky Diaz and the Family Jam Band are celebrating the release of their second album, Oh Lucky Day!, with a show at the Knitting Factory ($10) in Brooklyn on Sunday, May 1 at 12:30 p.m.
•And Brady Rymer and the Little Band That Could will be promoting their new album, Love Me for Who I Am, with a show at Brooklyn's Southpaw on May 14 at 1 p.m. (tickets $12 in advance, $15 at the door). 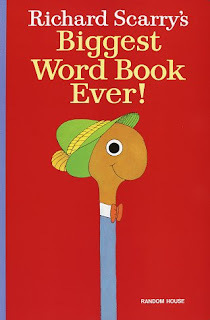 Biographical children's picture books do not tend to be my favorites. Most are informative, sure, and some are even well-executed enough to get across why the individual's life was interesting and/or important, but there's usually a certain dryness to the approach. Like children's history, biography for kids needs a spark; often the concept behind that spark involves, shall we say, literary license, as in Jonah Winter and Barry Blitt's wonderful (but not, um, entirely historical) The 39 Apartments of Ludwig Van Beethoven and Lane Smith's equally great (and equally imaginative) John, Paul, George & Ben. But Jeanette Winter (mother of the aforementioned Jonah) has been at this for a while. She's written and illustrated many biographical children's books in her long, illustrious career (including ones on J. S. Bach, Georgia O'Keeffe, and Beatrix Potter), and she knows exactly how to go about it: storytelling. 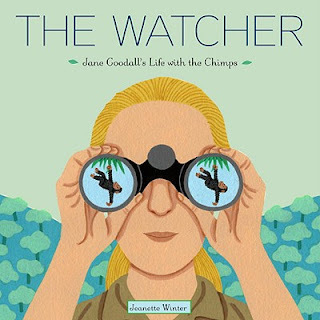 The Watcher, her lovely new picture book about Jane Goodall, is both a factual retelling of the primatologist’s life and a perfectly conceived storybook. And this book’s storytelling isn't limited to the text, as concise and informative (and factual!) as it is about Goodall’s life and work. 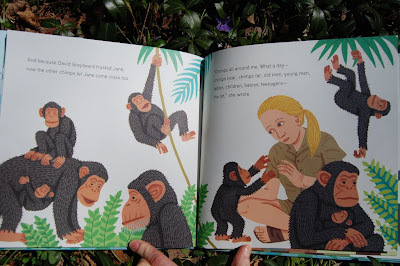 Winter’s bright, colorful illustrations, in a sort of American folk-art style, carry the narrative and especially the characterizations forward on their own, imbuing the individual chimps Goodall gets to know with personality. The expressiveness she gives her drawings of David Greybeard, the first chimp to strike up a “friendship” with Goodall, make the progression of their relationship through the years—marked by visible signs of aging in both—all the more moving. My two-year-old son can't get enough of The Watcher; while I suspect that he doesn't particularly care too much at the moment that it's about a living person, we like that he's being exposed, effortlessly, to the real life's work of this great scientist. (It's especially nice that the scientist in question is female, establishing that possibility as in no way strange.) As a bonus, the subject is of more than sufficient interest to our six-year-old as well, so it's a book we can read with both boys despite their age difference. Tom Lehrer's occasional forays notwithstanding, I've never thought of science as particularly compelling musical subject matter. And when it's children's music we're talking about, the inevitable educational overlay would seem destined to make songs downright stultifying. Sure, They Might Be Giants tackled the topic a few years back on their typically brilliant Here Comes Science—but they can apparently write catchy songs about anything at all. I certainly wasn't expecting to hear any more decent kids' music about science anytime soon. But Monty Harper, an Oklahoma-based artist I hadn't been familiar with, proved me wrong at one listen. (I really must remember not to underestimate the current crop of children's musicians.) 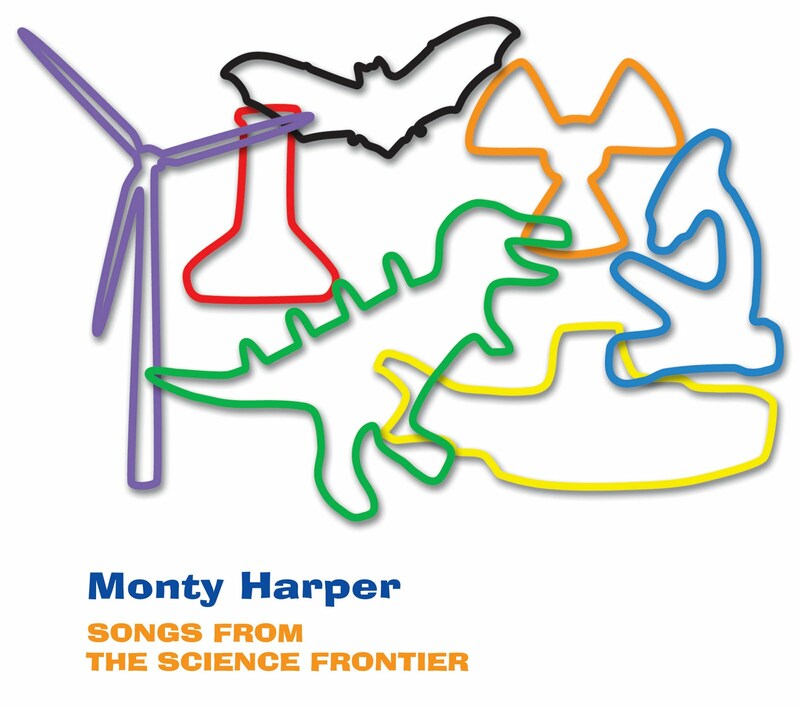 His Songs from the Science Frontier, released late last year (and produced by Chris Wiser of Sugar Free Allstars fame), may not have TMBG's rep and Disney's marketing power behind it, but it's fun and smart and apparently irresistible to kids—our sons wouldn't stop asking to hear it again once they'd discovered it. Second, and more important, this guy is a crack songwriter. It's not easy to write snappy songs about the intricate details of where wind energy comes from (starting, naturally, with the sun); Harper not only manages this, but makes it feel effortless. He seems to have an endless supply of infectious, surprising melody lines up his sleeve, incorporating influences that range from Justin Roberts to, well, Pink Floyd. And while his lyrical skill almost flies under the radar—a big part of writing good lyrics is making sure they don't stick out where they're not supposed to—once you notice that Harper is singing about some pretty complex subjects in rhymes that always fit together naturally, you grow more and more in awe of his talent. The end result is just what the artist must have intended: learning that doesn't feel like learning, but like easygoing fun. If we end up with a scientist or two in the family (who knows? ), we'll owe Harper a nod. There are tons of tween and YA books out there nowadays that intertwine childhood rebellion and the supernatural. (I was going to suggest this was the legacy of the Twilight books, but come to think of it, there always have been.) Nnedi Okorafor's Akata Witch stands apart from the rest, and not just because it's set in Nigeria. Akata is a derogatory term for black Americans in the Igbo language, and its use in the title is a hint that our heroine, twelve-year-old Sunny, is a girl who feels out of place everywhere. Her parents are Nigerian, but she was born in New York, where her family lived until she was nine; the family then returned to their native land. As if that weren't enough to make her the "different" one at school, Sunny is also albino. She stands apart, she excels in school but has few friends, and the popular kids bully her. So far, the usual stuff of YA novels since time immemorial, right? Except Sunny has these weird premonitions sometimes, warnings from the shadows in the Nigerian darkness that something bad is going to happen. And her mother, a doctor, is extremely circumspect when telling her daughter anything about her own mother, who died long before Sunny was born; Sunny has only a vague impression that she was very odd, perhaps crazy. The pieces begin to come together when she is befriended by Orlu, a quiet boy in her class who defends her from the bullying, and his friend Chichi, a free-spirited home-schooled girl. Seeing something special in Sunny, Chichi reveals that she and Orlu and their families are practitioners of juju, known as Leopard People. They explain that while the special abilities they have are generally inherited from one's parents directly, they suspect Sunny may be what they call a "free agent," with natural talents of her own. They're right, of course, and Sunny is soon initiated into a spectacular alternate universe of magic and danger and wonder. Soon afterward, she’s informed that she has a part to play: Along with Orlu and Chichi and a rebellious African-American boy from Chicago named Sasha, she is expected to stop a local serial killer known as Black Hat Otokoto, who has been kidnapping and killing young children locally for months. As that series did, Okorafor keenly portrays the convoluted mix of rebellion and growing responsibility that make the ages between childhood and adulthood so complicated. She also creates one of those fully fleshed-out alternate worlds that have long been the hallmark of the best children's series, from Lewis Carroll to Le Guin to Philip Pullman. 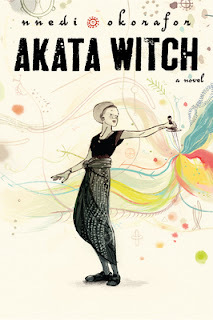 And she is as unafraid as LeGuin was to explore grim and dark realities, which makes the climax of Akata Witch—in which the four child witches face off against Black Hat Otokoto and the even worse evil he's trying to bring into the world—truly thrilling. But make no mistake: Okorafor marks out new territory of her own, too, with her magnificent use of Nigerian folklore; the magical realm Sunny is entering glitters with fascination. Most American readers will be completely unfamiliar with this world, but the author makes use of that fact, too, engaging our curiosity with the excitement of discovery. It's a triumph of a novel, one that teens (and many tweens, too, I think) will devour. And happily, Okorafor seems to leave the door open for a sequel, so this may not be the last we see of Sunny and her coven. I hope it isn't—there's plenty of fuel here for what could soon be a serious classic series of its own. As parents we tend, when looking back at classic children's books, to concentrate on the ones we loved ourselves, rejoicing in the chance to revisit them with our own kids. Or sometimes it's the undiscovered gems we somehow missed back then but got a second, parental shot at. But there's a third category: the books we knew but didn't care for that much—but now gain the favor of our children. Which brings me to Richard Scarry. I don't recall having much of his massive oeuvre myself when I was a toddler; I think I encountered his books mostly at friends' and relatives' houses. I was more puzzled than engaged by them; it may be that I didn’t discover their existence until I was a little past the fairly young age level most of them are for. As an only child determined to impress my parents with my reading ability by any means necessary, I'd have tackled Dostoyevsky without blinking despite a nearly complete lack of understanding—and as such, I was self-important enough at four to find Scarry's serious-faced cats and dogs a little silly. Griff loves it, and I can see that he's learning from it, just as Dash did. Clearly, my four-year-old self didn't know what he was missing. The word interactive, at least when applied to children's books, often seems like the sole property of the iPad nowadays. (Of course, it really goes back at least as far as our own childhoods and the Choose Your Own Adventure books.) But French illustrator Hervé Tullet's Press Here—technically a picture book, I suppose, though it feels like a genre all its own—is a reminder that a little imagination can supply the sense of wonder that’s already starting to fade as our touchscreens become routine. The concept is deceptively simple: The reader is presented with a yellow painted dot in the middle of an otherwise blank white page, with just the word “Ready?” below it. On the next page, the same dot, but with an instruction: "Press here and turn the page." When you do, you see that a second yellow dot has appeared, and even though you know perfectly well it would be there even if you hadn't followed the instructions, it feels magical. "Great!" the book congratulates you. "Now press the yellow dot again." A third appears on the next page. 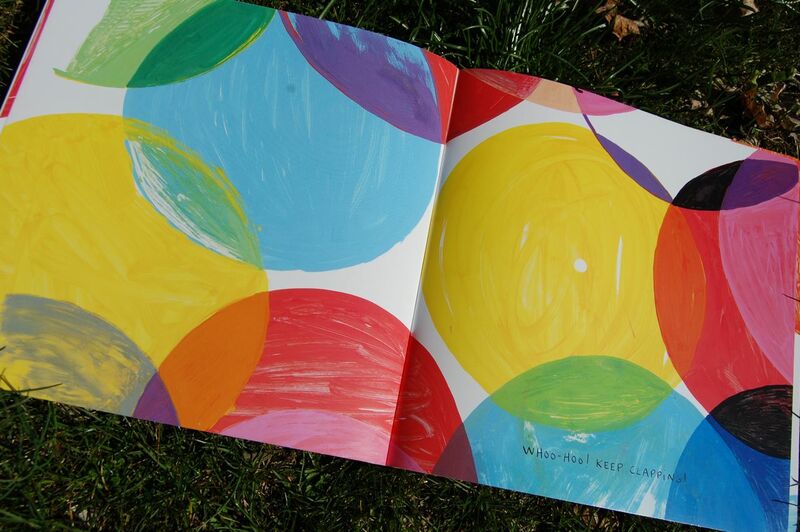 After again complimenting your work, the book tells you to "rub the middle one gently"—and it turns red. And so it goes, brilliantly, for page after page, with vivid, dynamic "results" coming from instructions to blow on pages, hold the book up on its end, tap its sides, and so on. Tullet's endless inventiveness takes what could have been a one-note concept through ever surprising variations, so that in its entirety, Press Here feels almost like a satisfying animated short. In a sense, that's what it is, really: the first slow-mo flip book. 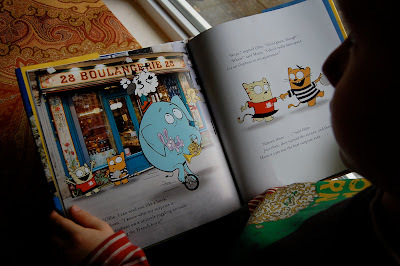 Even the youngest readers who can glean the words (mostly simple ones, all expressed conversationally) will start giggling within the first few pages, but my six-year-old was entranced, too. And parents will be hard-pressed not to smile with every page turn. This is one of those children's books for which you reserve a place of honor on the shelf, next to the Sendak and the Suzy Lee. So while I'm eager to see what creative breakthroughs technology will bring to children's books in the coming years—and I have no doubt there will be many incredible ones—it's also nice to see a fertile mind and brush demonstrate that print still has a trick or two left up its sleeve. You know how, at certain points in parenthood, you foolishly think you have it all down? Having covered this beat in its various forms for more than five years now, I was pretty sure I knew all the good children's shows currently on TV. In fact, I figured that everyone else knew about them too, and that posts on this blog singing the praises of The Backyardigans, say, would be at best preaching to the choir, and at worst pointlessly redundant. But as often happens in parenting—at least, to me—a recent event has shocked me out of confident complacency. Having long been vaguely aware of something called The Upside Down Show amid the sea of Nick Jr. programming, we finally stopped long enough to watch an episode. (No surprise: This adventure into the unknown was entirely kid-driven.) In an instant, it became everyone's new favorite kids' TV show. 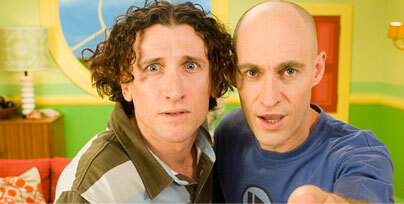 To the similarly uninitiated: The Upside Down Show, a live-action program, stars two Australian "brothers," Shane and David (their real names, though they're not real brothers). They live in a house full of unusual rooms and creatures that they themselves haven’t fully explored; each episode is based around their efforts to find a specific room, which they do with some difficulty. 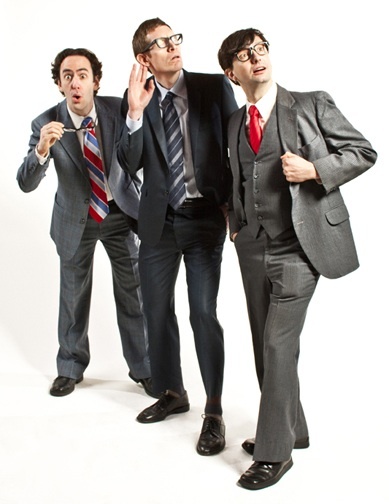 I should add that Shane Dundas and David Collins originally made their name worldwide as the Umbilical Brothers, a comedy stage show for adults that was known for its imagination, stagecraft, and showmanship—precisely the qualities that make The Upside Down Show so remarkable. Their execution of the remote-related antics makes this the kind of kids' TV that stops parents in our tracks, mesmerizing us just as it does our children. I'm pretty sure our boys are more obsessed with the show than we are—we find them laughing over Shane and David's routines randomly at the breakfast table sometimes—but occasionally I do wonder. So, to sum up: endlessly clever and imaginative writing; performances that kids flip over; smart slapstick and humor that will make the adults in the room laugh out loud; and you can feel as cool and in-the-know for watching it as you did as an early adopter of Arrested Development (well, almost). How did it take us so long to find this show? Sometimes a new children's book makes me say to myself, Man, I wish this had been out when I was a kid. 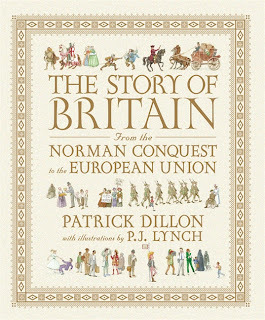 And since I’ve always been a history fan—I’m the son of an ancient historian, so it seems to run in the family—Patrick Dillon's The Story of Britain certainly had a head start at that honor. 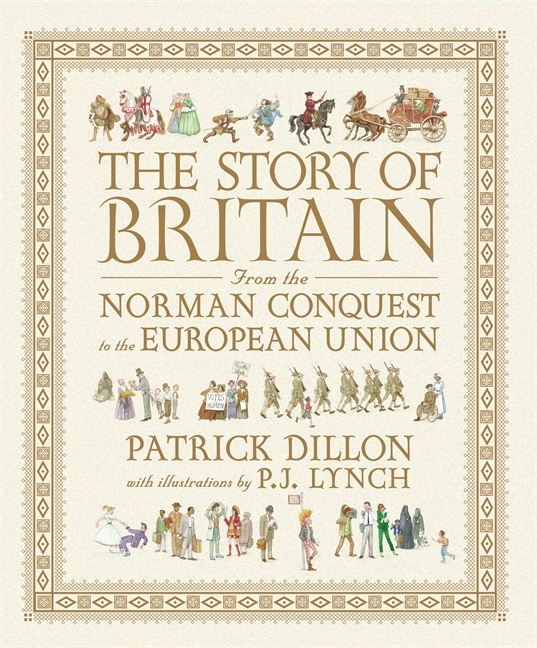 This handsome hardcover for historically inclined middle schoolers and up ambitiously takes its reader, as its subtitle says, "from the Norman conquest to the European Union." Children's history is a tricky business, though, and most of the attempts I've seen fall into one of two traps. Either they hew too closely to the old-school "just the facts and dates" approach, resulting in dry, dull pages that even the most history-inclined kid would give up on, or they’re so concerned with amping up the action that they skip vital issues entirely—and end up being fairly useless as history. Dillon neatly walks a path between those two poles, by containing every episode and subject in a short, digestible chapter of a mere page or two in length. With large subjects that would be difficult to sum up in that little space—World War II, say—he expands on his schema rather than deserting it, devoting several of his brief chapters to different aspects. This pays off marvelously, making The Story of Britain doubly useful, as both a fast journey through the entirety of British history and an excellent quick reference on the individual subjects. (In that regard, it’s even handy for parents who might be looking for a speedy refresher on the Wars of the Roses or the Dissolution of the Monasteries. Hey, it could happen!) 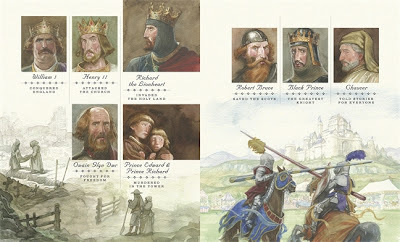 The format, and Dillon’s perfectly light touch as a writer, keep everything moving along nicely, while the many evocative watercolors by illustrator P. J. Lynch (some examples are shown below) bring the people and topics he's covering even more vividly to life.